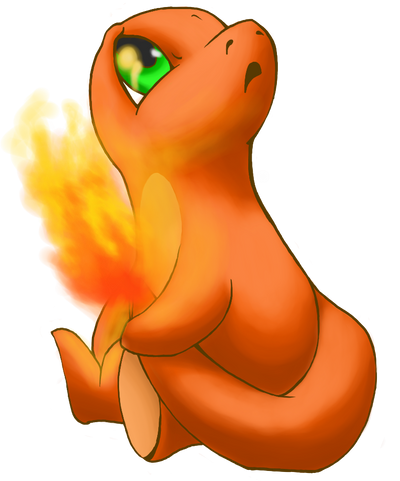 Pokédex Entry -The flame that burns at the tip of its tail is an indication of its emotions. The flame wavers when Charmander is enjoying itself. If the Pokémon becomes enraged, the flame burns fiercely. History Mara was the last to hatch of her brothers and sisters, but was the largest of all of them. Though her name was feminine, she was anything but. She had a deep voice and a silly personality. She often makes jokes and makes silly faces to make others laugh, even if it's at her own expense. She was so much of a tomboy, that she was often mistaken for a male. She didn't mind that others thought she was though, so she shortened her name to Mar. When her family was attacked in Kanto, her parents were killed in a brutal fight with the water-types who came crawling out of the ocean. Her older brother carried her the whole way to the Hoenn region, where they thought the epidemic didn't hit...but it was already there. There they tried their best to stay alive and protect their den, but near the end, they couldn't hold them back. They fled, seeking out a safe haven. Since then, they have encountered many of the living, joining them in temporary alliance until fate led them elsewhere. - She's androgynous. She has a deep voice and is a tomboy. User Notes - She had one older sister and two older brothers. -She is loosely based off of Haruhi from Host Club. Pokédex Entry When expelling a blast of super hot fire, the red flame at the tip of its tail burns more intensely. History Ashes was part of a rebel clan of dragons, based on a small isle near the Cinnabar Islands. 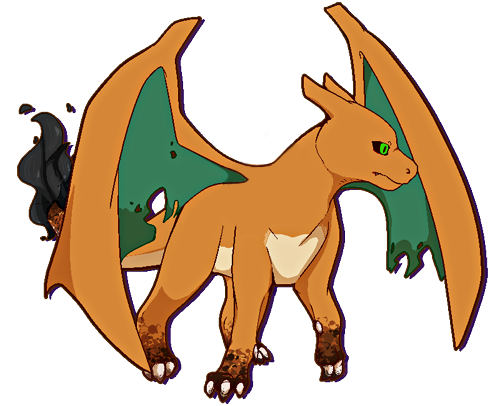 He was born and raised there, and once he was old enough to compete, he sparred with the others males to become the leader, though he was more focused on caring for his younger siblings. The island was small, and the fire types were in constant conflict with the water-types of the ocean, often fighting each other for territory. He was always by his youngest sisters' side, even when the epidemic hit. The day that it did he lost his whole family- all but Mara, who couldn't go out to fight. The dragons' code was that of valor and strength; their fiery personalities did not allow for any of those able to fight to stand idly by...so the entire clan was wiped out within a matter of days. After days of bitter and unending onslaughts of water pokemon attacks, his family finally fell to the attacks. His siblings had died in battle. His parents ordered him to take Mara someplace safe...while they stayed and fought. He obeyed their dying wishes, a deep pain burning in his chest as he heard Mara crying as they watched their father swan-dive into the rocky ground with an infected in his grip, both instantly dying on impact, and heard their mothers' dying cries as she was torn apart. He flew for as long as he could, landing only to avoid large flocks of the undead. They made it all the way to Hoenn before finding a small den. He thought it would have been safe there; he had not seen many infected for miles. But in the middle of the night, a hoarde began to claw their way into the den. He fought back, finally taking Mara and exploding out of the den to flee up into the sky. Since then, they have encountered many of the living, joining them in temporary alliance until fate led them elsewhere. Appearance - He walks on all fours the majority of the time. Personality - He is the eldest of the siblings, and the only other survivor, other than Mara. - The epidemic has made him unpredictable. His personality was usually very calm and logical, but his pain/anger will flare up and he'll lose his temper. He is now constantly fighting back the urge to just burn everything in sight. - He won't harm Mara, no matter how bad he gets. - Based loosely on Angel/Angelus from Buffy.